SALINAS, CA (Oct. 10, 2016) – Church Brothers Farms, a leading grower/processor/shipper of more than 500 fresh vegetable SKUs, will launch two products and feature new packaging at the PMA Fresh Summit in Orlando in booth 1029. The company developed a new value-add broccoli stem product with the goal of reducing food waste and increasing grower yields. Our diced broccoli stem blend does both, said Kori Tuggle, vice president of marketing. Cleaned and cored Redy-Pep™ Peppers is the second item being unveiled at Fresh Summit. The value added bell peppers have the top and seeds removed to offer consistent quality, size uniformity and convenience. The new-to-market format reduces food waste, labor and freight costs because of its longer shelf life than traditional peppers; and may be stored from 34 degrees to 38 degrees. The company’s research and development group created the new items as part of its overall commitment to reducing food waste. 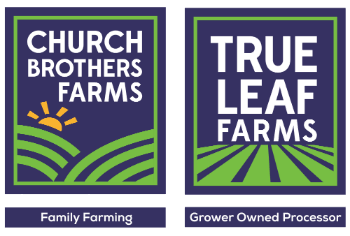 Church Brothers Farms will debut new packaging in Orlando; highlighting a redesign for its retail club-size clamshells and poly bags with the True Leaf Farms brand. Also in booth 1029, the company will showcase its organic tender-leaf product line and newest blends, Kale Color Crunch and Baby Kale Medley, in addition to the full line of commodities and value-added packs created for foodservice and retail channels. In other Fresh Summit activities, the company will celebrate Director of Food Safety and Sustainability Megan Chedwick receiving the 40 Under 40 recognition from Produce Business.